A portrait of a devotee seated in meditation (using a Yogapaṭṭa). 19th century (early). Drawing on paper. 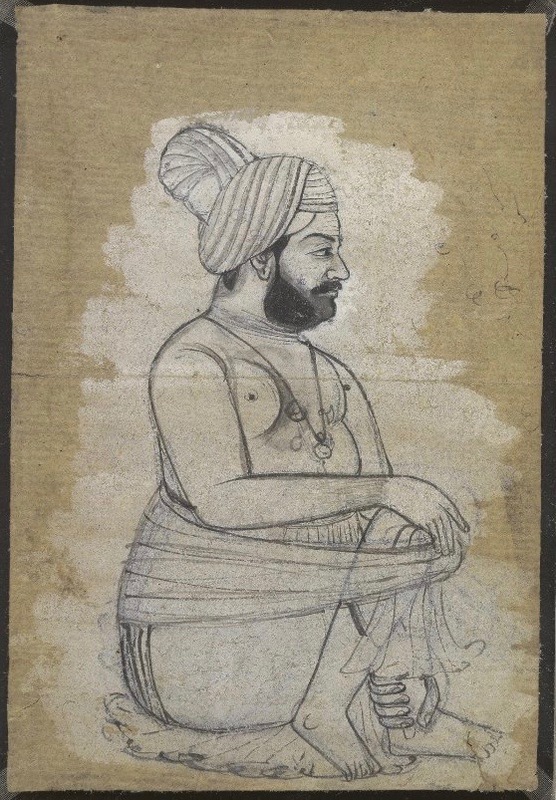 Rajasthani-style (14.3 x 9.9 cm). Apart from the ṣaṭkarma, there is evidence for one other significant development of a distinctly Yogic therapy, which was called such (i.e., cikitsā). This therapy is described in a chapter appended to the Haṭhapradīpikā’s four chapters in two manuscripts. The colophons of both manuscripts mistakenly entitle it as a section on herbs. It was undoubtedly added to the Haṭhapradīpikā at a more recent time, most probably at the beginning of the eighteenth century, judging by the date of one of these two manuscripts. Seeing that very few catalogue entries report of a Haṭhapradīpikā with five chapters, it is probable that the chapter on therapy had only a brief association with this Haṭha text. The chapter has been taken from a Śaiva text called the Dharmaputrikā, which teaches a system of Yoga with six auxiliaries (ṣaḍaṅga) for the Śaiva laity. The Dharmaputrikā is sometimes included in bundles of manuscripts of the Śivadharma corpus, and it must have been composed earlier than the mid-eleventh century on the basis of two dated manuscripts. The fact that its chapter on therapy was attached to at least two manuscripts of the Haṭhapradīpikā suggests that it had some currency amongst yogins from the sixteenth to eighteenth century, possibly because of their interest in the practical application of its therapy for curing illness. In whatever place pain arises because of disease, one should meditate with the mind on the breath in that place. Having meditated on it with a one-pointed mind, [the yogin] should breathe in and out completely, carefully [and] according to his capacity. Having performed many exhalations and inhalations again and again, he should draw out the breath that has accumulated [there], as one [would draw out accumulated] fluid from the ear with water. This method is distinctly Yogic insofar as it relies on the yogin’s ability to meditate and manipulate the breath. Other verses in the chapter provide further advice on diet, the practice of kumbhaka, prāṇāyāma in a supine position and the various diseases that can be cured by this therapy. A significant comment on this therapy’s relation to Ayurveda is made towards the end of the chapter, when the yogin is advised to perform this Yogic therapy (yogacikitsā) in addition to taking the treatments prescribed in Ayurvedic texts (vaidyaśāstra). Therefore, it appears that the author of the Dharmaputrikā understood its Yogic therapy as distinct from but complementary to Ayurveda. The art of healing diseases through meditation has another antecedent in Tantra. For example, the treatment of diseases (rogacikitsā) using concentration (dhāraṇā) on the elements and meditation can be found in the Matysendrasaṃhitā, which was composed at the time when early Haṭha and Rājayoga systems were being formulated. There are even traces of this conception in the Pātañjalayogaśāstra: 1.32, in which the hindrances (antarāya, vikṣepa), including disease (vyādhi), are said to be prevented by focusing the mind on one object (ekatattvābhyāsa). Birch, J. 2018. "Premodern Yoga Traditions and Ayurveda: Preliminary Remarks on Shared Terminology, Theory and Praxis." History of Science in South Asia. Vol. 6 (April): 1-83. Stay tuned for a forthcoming article by Dr Christéle Barois, in which she will be providing a detailed study of the Dharmaputrikā's chapters on medicine as an integrated part of yogic practice, including the yogacikitsā one. For a detailed study of the Dharmaputrikā's chapters on medicine as an integrated part of yogic practice, including the yogacikitsā one, we can also look forward to Christele Barois' detailed study of the Dharmaputrikā. Christele is just finishing up her first article on this, and is planning to submit it to History of Science in South Asia. Wonderful, we are truly looking forward to it!